Oh yea... as you said German Tier8 is 43 44 tanks versing allied armor specifically designed to counter them, and let's take Centurion for start. What is REAL LIFE thickness of Centurions armor? Why German tanks keep "Historic Values", while Centurions have FANTASY armor thickness, if they can have it, why Panther2 does not get 300mm Turret front just like Centurion? How about Tiger2 gets 300mm Turret front huh? Ahhh Tier9 German Heavy tank has WORSE ARMOR than Tier8 Centurion, well that's tough! The BLUE part is LESS. Are you confused by the concept of OVERLAPPING spaced armor parts over regular armor? If Magenta part was 200mm, are you basing your claim on 1/3 of gun-mantlet ? Are you confusing "Turret Front" with Gun-Mantlet ? Do you say whole Ferdinand upper hull is impenetrable only because gun-mantlet is ? I will stop the same moment you say what is the right ____mm figure / value for today's Centurion turret front, is it 250mm or 350mm ? The RED part is (was) 165mm BASE - when SLOPED or ANGLED the value increases - and that Old Old centurion1 turret model had CURVED edges, it made some higher values. It is 165 from one edge - to other edge, up or down, there is no confusion about it. and EFFECTIVE value goes up on OVERLAPPING parts, where gun-mantlet covers the 165mm red base. But the base value remains 165mm. The turret brow? The turret ROOF you mean, the plate with nominal 50.8mm value? You are now dragging the gun depression in the whole discussion, I am telling you that you can not get 85 degrees or more on turret roof, and as you mentioned gun depression, with only -10 your "Turret brow" will not be impenetrable to HEAT, BECAUSE HEAT DOES NOT RICOCHET UNDER 85 DEGREES FASDFAPWFJORGLGJDSFASDFASEPKEPAWKDAWD. Ok, lets entertain your fantasy for one second, lets say turret roof was IMPENETRABLE. Why is it important and Why do I keep bringing up the HEAT issue??? Because they buffed your IMPENETRABLE roof by 90%, they almost DOUBLED it's thickness, if it was impenetrable in the first place; WHY DOUBLE ITS THICKNESS WITH A BUFF ?????????????? Getting there in teeny tiny baby steps ... 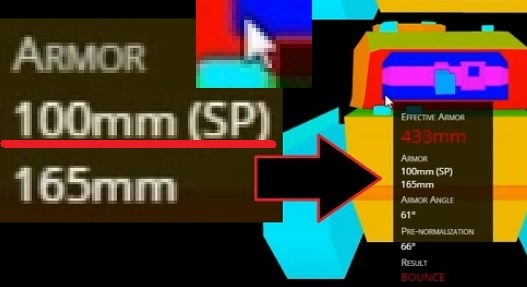 The red is 165mm and the blue bit is a layer on top if it..... soooo.... extra layer of (spaced) armour (100mm) + 165mm =165mm? or more than 165mm? (or as you now seem to be trying to imply less than 165mm?) or does somewhere in the region 70% of the front of the turret not count as the front of the turret in your eyes? As you again seem to be trying to imply in your comments about spaced and overlapping plates because here is news for you ... Two layers of armour on the front of the turret (staggering concept i know) is turret armour! and the mantlet is also turret armour!!! 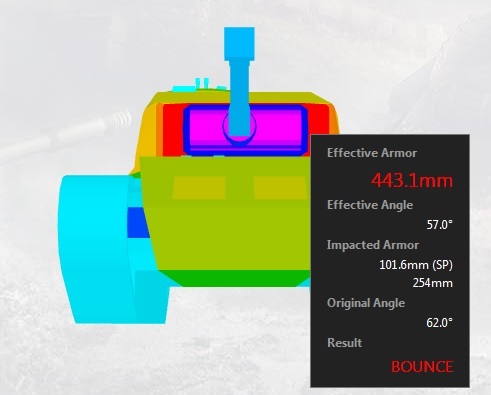 I keep going on about complicated things like gun depression as it alowed you to make your armour more effective against incomming rounds ...you know armour going from weak to strong If the vehicle armour was used as it desinged to be used in a fight. Oh and by turret brow I mean exactly that, the greenish sloped bit between the mantlet top and the turret roof. Finally what are you talking about when you say the angle will never exceed 85 degrees...of course it will...do you understand what being on a ridge is? It means that your tank is usually at an elevated position from the target that is firing at it increasing the angle before you even start using that gun depression to shoot back down at the said target. Unlike your poor "abused" Germen meds that never had tough turrets and are not ridge fighters. A point you have flatly refused to recongise while whining about o/p British tanks. Edited by 5everin, Today, 12:33 AM. Pretty much, though Im not sure about "great again" as it was always pretty poor (in game) from memory. I know I hated the thing when grinding through it. I thought the Tiger 1 and e75 were both pretty good. Though the E75 has got a little left behind with all the power creep in the higher tiers. Of all the German tanks imo its the Tiger2 and the Leo1 that are most in need of a major upgrade. The leo I love but it is in a very sad state at the moment. Edited by 5everin, Today, 12:58 AM. So what you are saying is that today Centurion1 has 440mm of turret armor? 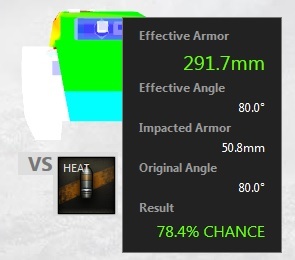 It seems like you want to call armor numbers by "Effective" value instead of nominal, we can play this game but be consistent. Every single point you make about slants, edges and curves - applies to both old turret and the new. 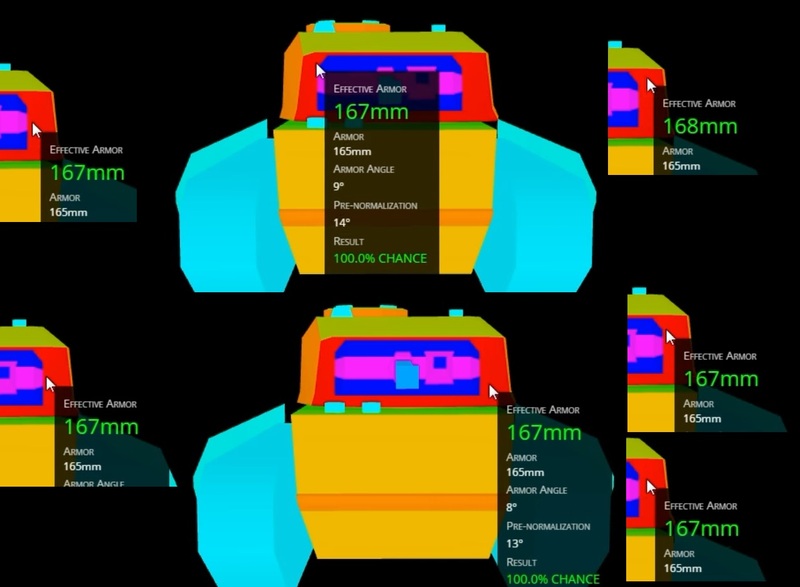 If old Centurion had "200mm" turret armor, then today's one has 300mm+ turret armor. Buff from 165 to 254 is same as from 200 to 300, you can call it whatever you want, but the fact remains they almost doubled thickness on every frontal plate. Do you understand that you can not get 90 degrees as it would make shell trajectory parallel to the plate? So you are basing whole part of your claim on ONLY 4 degrees, only in that 4 degrees (86-89) can a HEAT shell hit a plate and ricochet. That is more fantasy than real gameplay, most times you can get turret roof at angle between 70 and 80 degrees, and that can ricochet AP/APCR shells but HEAT will still penetrate. By my calculation centurion1 using its MAXIMAL gun depression can get turret roof to a MAXIMAL 80 degrees, it does not come even close to 85. And what happens when in 90% of the cases HEAT shell misses commanders cupola and hits turret roof? Old Turret had 50mm roof and HEAT would penetrate, now the new FANTASY almost 90mm roof will bounce Tier10 HEAT shells. When Tier8 medium tank like Centurion has a STRONGER turret than Tier9 Heavy E75 - on the FLAT ground, it makes a very good point. Tier6 meds got some buffs, it made them good. Good example was Vk3002M, a tank that most resembles a Panther. From total crap, it became a great Tier6 medium, a really good one! Too bad that for every little 20mm armor buff, new counterpart (T34-85M, etc) got the same, but better. So all those little 20mm buffs are same story like the Buff that made MAUS most talked tank in the game. Only to be "De-Buffed" while BOBJECT entered the game, and every single british tank got +150mm armor. Tortoise went from "best DPM in the game" to "Blocks more damage than MAUS, AND has (second)best DPM in the game." New Objects with UFO hulls and FANTASY armor enter game with 340mm HEAT pen, but still everybody cries about MAUS. For Every +1 to german tanks is +10 for others. I must add that shell trajectory is not flat, but on higher tier tanks it is more flat than curved, it would take a looong range shot to add 10+ degrees and is something rarely seen in WoT.